The National Sales Group represents clients to the retail and distributor classes of trade on a national level as well as a regional level. 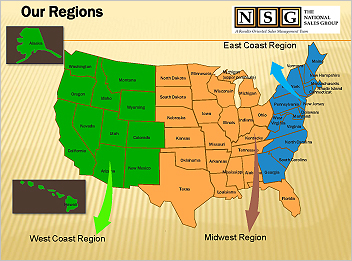 As displayed in the map below, we cover the US in three regions: West Coast, Mid West and East Coast. During initial meetings, the prospective client and NSG will determine in what ways and in what areas NSG can be the most effective in building the brand and increasing sales. Every client has a program created specifically to address their needs.